In the last ten years, soccer has taken off in popularity in the United States. At one time soccer was far behind baseball, basketball, football and even ice hockey in acceptance. However, that is no longer the case as soccer in the US has skyrocketed in appeal, despite still being treated as an outcast by much of the mainstream media. The US and Canada’s Major League Soccer has averaged 21,571 fans per game in 2016. That total has been well above the National Hockey League’s 2015-16 average of 17,481 and the National Basketball Association’s 17,864. Although the MLS has been around since 1996, the league didn’t see much love from casual American soccer fans until the arrival of David Beckham in 2007. He converted many non-soccer watchers into new fans. Since then, the league has seen incredible growth in supporters, merchandise sales, and kids playing the game. Not only has public interest grown exponentially, but so has the number of teams. MLS has added eight teams since the beginning of the 2007 season, and will add two more in 2017, taking the league’s total to 22, with 4 more coming in the next 2 years. MLS may be the top of the soccer pyramid in the US and Canada, but there has been an enormous amount of “minor” league teams founded as well. Many of those teams are drawing a large number of fans to each game, proving that soccer is not only viable, but sustainable in the US and Canada. The fanbases have grown, and fans have become more knowledgeable and passionate. No longer are American and Canadian fans thought of as clueless, as the league’s supporters have shown they have become some of the most zealous fans in the world. Let’s take a look at America’s best soccer destinations, and why these American towns make traveling to see a game a “religious” experience. 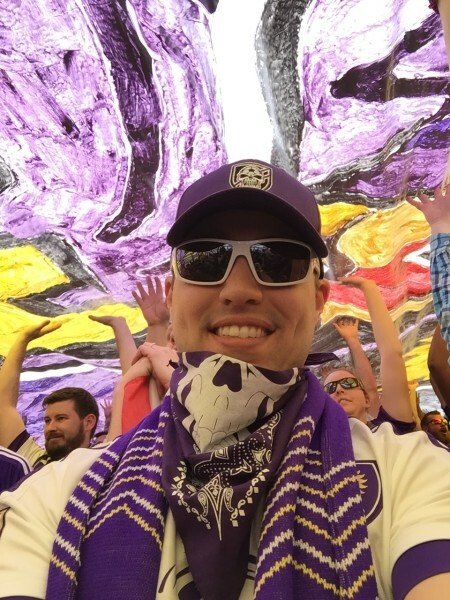 No one needs an excuse to visit the land of Mickey Mouse, but Orlando City made its MLS debut in 2015 and promptly set the league’s attendance record for an expansion team at 32,847 fans per game. The city took to the soccer club early on, which was actually founded in 2010 with much success when the team played in the United Soccer League, the current third-tier of US soccer. Under the TIFO at OCSC. A TIFO is the very large artwork unveiled by the supporters group before each match. Orlando City has failed to be one of MLS’s top sides on the pitch so far, but the fans have continued to show up in droves. The team continues to pack out Camping World Stadium (formerly the Citrus Bowl) in Orlando, however, the club will open its new stadium in 2017. The new ground will seat 25,000 fans, and Orlando City has already sold all 18,000 season tickets. Traveling to Orlando is not complete without seeing a Lion’s match downtown. Tailgate and march to the match with one of the league’s most boisterous supporters groups, known as the Ruckus and the Iron Lion Firm. The success of Orlando City has inspired MLS to put a second team in Florida and the league hopes to have a Beckham co-owned team in Miami by 2020. The Seattle Sounders have been attracting soccer fans from all over the world since their MLS debut. Fans can march to the match for every home game, and possibly get a look at co-owner Drew Carey. In 2015, Forbes ranked the Seattle Sounders as MLS’s number one most valuable team. The Sounders have only been playing in MLS since 2009, but the team can trace its roots back to the 1970s when Seattle was home to the original franchise. Since day one, the Sounders have had the league’s top attendance. The fanbase is rabid, and supporters have gained infamy throughout the league for their mean green passion. That rabid supporter has helped the Sounders win four US Open Cups. Although the team hasn’t been able to parlay that into an MLS Cup win, the Sounders are continually one of the league’s best clubs and best supported. Seattle’s supporter culture has been on the cutting edge in MLS, and can be thanked for inspiring so many other clubs to push the boundaries of tifo and support in the league. There is definitely no reason not to get out and see the Rave Green while in Seattle and the team are a must-see, just like the famed Space Needle. American’s hipster city, full of pubs serving distinctly local American ales, it doesn’t get more punk rock than Portland these days. The Portland Timbers, like Seattle Sounders, can trace the team’s history back to the North American Soccer League in the 1970s. Since joining MLS in 2011, the team has seen mixed results, although the Timbers did capture the 2015 MLS Cup defeating the Columbus Crew 2-1. Portland has some of the best support in the league, averaging 21,144 fans in 2016. The team’s supporters are just as passionate as those in Europe, and the noise they produce is second to none in the league. The club’s mascot, Timber Joey, is unique to soccer anywhere in the world as he cuts rounds from a log every time Portland scores a goal. He and the 21,000-plus that pile into Providence Park every match day provide a truly special atmosphere in America. Go for the soccer, stay for the amazing atmosphere of the city on the edge of natural beauty. Mount Hood, the Portland Japanese Garden and Forest Park will all get you in touch with nature. Arthur Bryant’s is a Kansas City institution, just like the city’s barbecue. So, if you’re heading that way, make sure you get out and get some ribs. After that, head over to Children’s Mercy Park to see Sporting KC, a team that is becoming an institution of their own. Sporting KC is one of MLS’s original teams, though the franchise went through a re-branding in 2011. Prior to that, the franchise was known as the Kansas City Wizards. Although there wasn’t much that was magical about the team. Despite the team’s one MLS Cup and US Open Cup victories as the Wizards, the soccer club was a relative unknown in Kansas City, playing in the monstrous Arrowhead Stadium. That all changed in 2011 when the team’s owners On Goal – now known as Sporting Club – overhauled the franchise, changing the team’s colors, kits and moving into a brand new stadium of its own. Since the re-branding, the team has seen more success than ever before on and off the pitch. Sporting has won one MLS Cup and two US Open Cups since 2011, and the team is continually near the top of MLS’s standings. Sporting is averaging 19,570 fans per game, MLS’s 12th best attendance in 2016. Like Seattle and Portland, Sporting has a passionate fanbase that know how to produce creative tifo displays. Looking at the club 20 years after its inaugural season, it is hard to believe it is the same team. Don’t forget to get yourself a Boulevard Beer while in Kansas City, too. Get over to the brewery for a free 60 minute tour before sampling some gorgeous brews at the end. The Big Apple is a sports Mecca. Whether it is baseball, basketball, football, ice hockey or even soccer, New York City is the place to be. Of course, there is the famed Madison Square Garden where so much history has taken place. Yet, a new page of history is being written over at Yankee Stadium, but it isn’t baseball. New York City FC joined MLS in 2015 alongside Orlando City. The Blue half of New York, the club shares the city with the Red Bull energy drink owned New York Red Bulls, has displayed a soccer passion unseen by many in the city prior. Co-owned by Major League Baseball’s New York Yankees and English Premier League soccer team Manchester City, NYCFC has enjoyed outstanding fan support from its first game. The team play home matches at Yankee Stadium, which isn’t the best venue for soccer due the pitch being far narrower than the rest of those in MLS. It also allows for some poor sight lines for fans. The club is working hard on finding a site for a new stadium. Currently, there is a proposal for the team to build a $400 million arena at Columbia University that NYCFC would share with the university’s sports teams. The team’s most passionate fans, the Third Rail supporters group, has over 1,600 paid members. The group can be heard every home match in sections 236 and 237 fuelling its team’s performance with chants and songs. Unfortunately, the Third Rail has seen some ugly incidents in its short lifespan. However, the group still sing loud and proud every time NYCFC is in town. Fans from all over the world have been flying in for games, taking in the sites of the Empire Stadium Building, which is actually turned blue every time NYCFC beat their Hudson River rivals the Red Bulls. Outside of MLS soccer is thriving, giving teams like FC Cincinnati hope that someday they will make the step up to the USA’s top soccer league. Cincinnati debuted in 2016 in the USL (the third level of the US soccer pyramid), and regularly see over 17,000 fans turnout to Nippert Stadium. The club showed that soccer is alive and well in the city. Amazingly, over 35,000 fans saw Cincinnati play a summer friendly against English Premier League team Crystal Palace in July. The buzz around the team all season prompted newspapers in the UK to investigate the popularity of the club. The team has not only been a success in stadium, but the team has been a success on local TV. Over 10,000 households in the Cincinnati area have tuned into their home games during the regular season. Like Cincinnati, Sacramento Republic FC plays its soccer in the USL. The 2014 USL champions have even been courted by MLS, but with three teams already in California, it may not be likely that the team sees life in the soccer top-flight for some time. Despite that, the team has averaged over 11,000 fans per game in 2016. Sacramento’s home, Bonney Field, was opened in 2014 and has been a mecca for soccer fans in the northern California region ever since. Scheduled to join MLS in 2017 as one of the league’s two expansion teams, Minnesota United leads the North American Soccer League in attendance this season with 8,464 fans a game. The NASL is the second-tier of US soccer, and despite crowds not being as large as in the MLS, the league has been the beginning point for several top teams in the US. United will become MLS’s 22nd franchise in the league, and will open a new stadium in St. Paul sometime in 2018. Chattanooga FC is one of the fairy tales of US soccer. Founded in 2009, the team plays in the fourth-tier National Premier Soccer League. The NPSL is a regional, semi-professional league that operates in 80 cities across the US. Chattanooga is the league’s top side in terms of fan support. In 2015, the club set an all-time record for fans at a US semi-professional match when more the 18,000 watched them play New York Cosmos B in the NPSL Championship Game. The club’s supporters group, the Chattahooligans, is out in force every home match. The group has been the catalyst for the team’s outstanding attendance over the last eight season. The Chattahooligans fervent support has helped the team win six Southeast Conference championships and finish as NPSL runners-up four times. Traveling and sports have been my life for some time. Over the years, I have written for many sports websites and magazines, mostly about soccer, while traveling the world to see matches. Through my work in soccer, I have been able to see the world, and written about my journeys. An author, journalist and traveller, I am interested in continually writing about my experiences.